For the first time since 1918, snow fell in Buenos Aires, Argentina, late on July 9, 2007, reported the Associated Press. The snow was still there the next morning when the Moderate Resolution Imaging Spectroradiometer (MODIS) flew over on NASA’s Terra satellite at 10:55 a.m. local time. This false-color image, made with a combination of infrared and visible light, reveals the snow beneath the clouds that still hang over the coast. 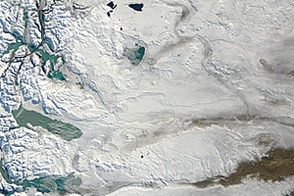 In this image, snow is pale turquoise blue, while clouds are lighter blue and white. Not only does the snow blanket Buenos Aires, but it also covers a broad section of the highlands to the west. The snow was short-lived, however. 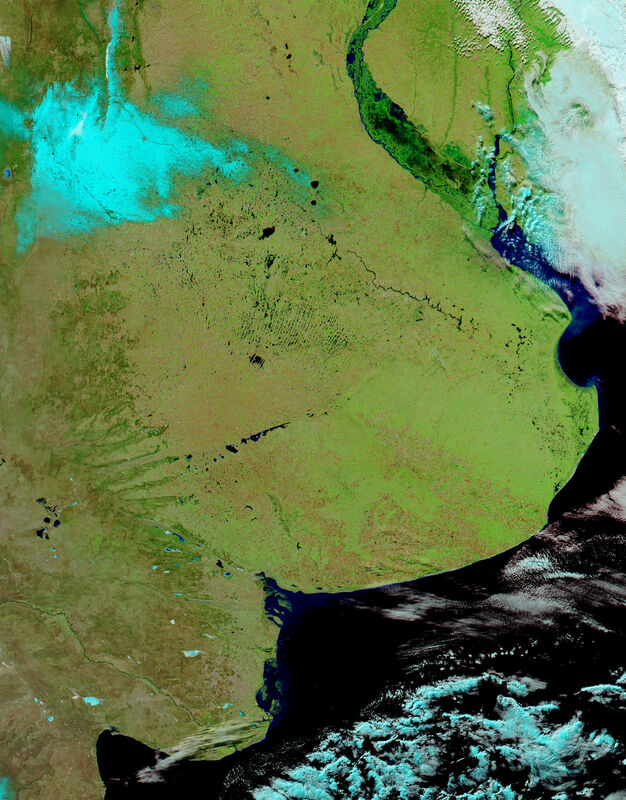 By the time MODIS flew over on the Aqua satellite at 3:10 p.m. local time, both snow and clouds were gone from Buenos Aires, the cement-colored area on the southern bank of the Rio de la Plata in the lower image. The snow had also receded significantly in the higher elevations. The snow fell during a long cold snap that claimed 23 lives and caused an energy crisis, said the Associated Press. 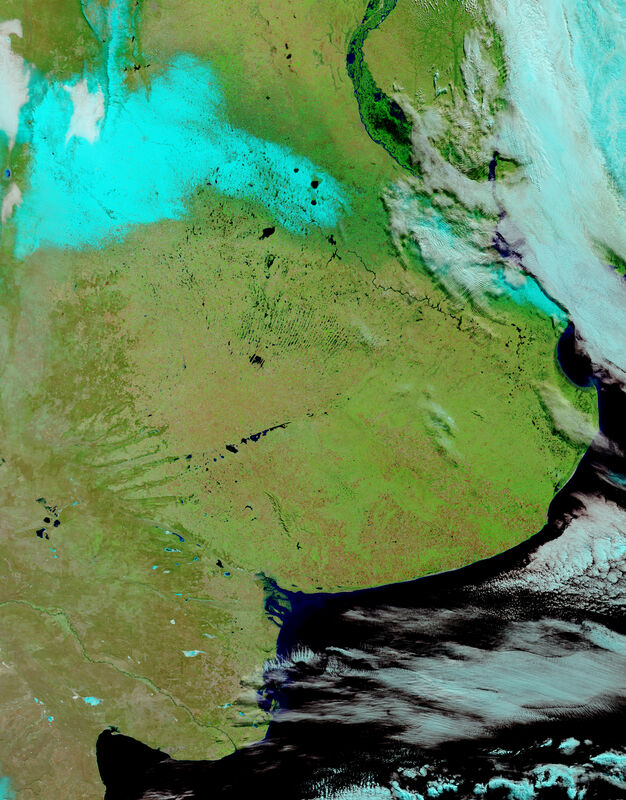 True-color, photo-like images of the snow in Argentina are available from the MODIS Rapid Response System. 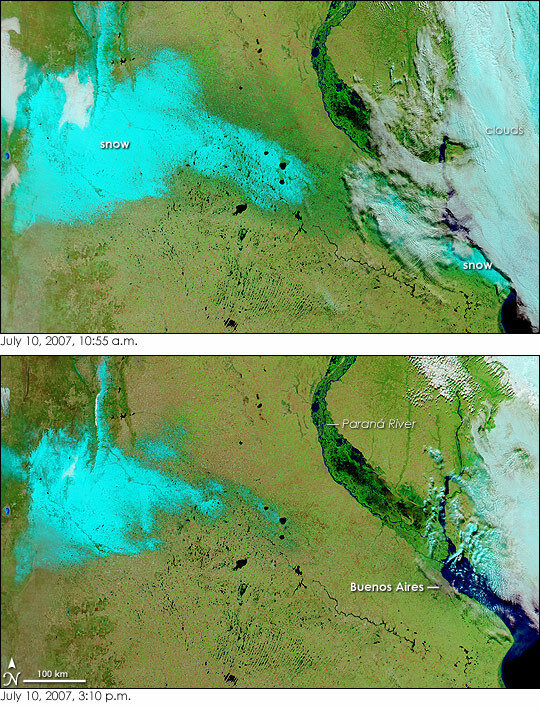 NASA images courtesy the MODIS Rapid Response Team at NASA GSFC. For the first time since 1918, snow fell in Buenos Aires, Argentina, late on July 9, 2007. The snow was still there the next morning when the Moderate Resolution Imaging Spectroradiometer (MODIS) flew over on NASA’s Terra satellite at 10:55 a.m. local time.